Lol, I was just coming here to post this. Dude is so ****ing good. That is unreal. Reminds me of Vince Carter in college. Yeah, that extra weight is slowing him down, lol. Not sure what this kid is. I get AD is great but its the "What ifs" that spin in my head. "What if" he is better than AD in two years? Does it make sense to sign Durant if Durants timeline is to win a chip right away? our core won't be ready so fast. 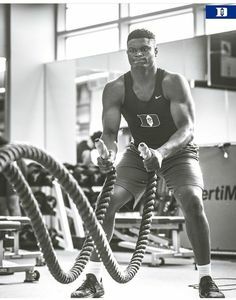 Agree 100% - if we land a Zion or a really good/possibly centerpiece player in the draft - that probably won't mix well with adding 2 max vets that are here to team up for a championship run. They will be the focus of the team and likely conclude they need more experienced vets to help them win. So we'll end up giving away much of our young players for Shumperts and similar-type players as a result. Why not draft smart and develop these young guys? I'm not even a fan of Knox as an example, but think he deserves a chance to see what he can be. Durant and Kyrie or another max guy probably gives us a window of 2-3 years before then having to start over. What happens with our 4-5 talented young guys who don't play that much and are up for new contracts? I suggest we pass on anybody over 29 (so Kawhi could work if he was interested) and keep developing our young guys. I'd rather see what Mitch Robinson becomes in two years simply because we never actually do that. We always sacrifice the young guys to go after the older players. But you generally don't become more athletic as you age. The extra weight may not be a problem at 19, may be a different story at 29. He definitely has to stay on top of it. A laundry list of overweight players who couldn't stay in the league long due to weight issues. But if we get a great 10 years from him who would care anyway? Take away the stupid flying tricks and keep him a bit more grounded. So he can't hit an outside shot like Curry. Lebron couldn't either. But what can this kid do to open up an outside game? you iso him he can beat you to a pulp in many ways. We have a ceiling on his outside game at 19? The weight? Those legs look like they are engineered different than any highflier at 19. Vince, Jordan, Antoine, were all skinny leapers. Im thinking what does he evolve into over 10 years? I wouldnt put too much stock in the extra weight, whatever it is. Being able to jump that high demonstrates that its not having an impact on his game. The recent science says that not being ripped isnt necessarily a sign of needing better conditioning. If he was in Mike Sweetney territory, that would be something else. Nalod wrote: This kid look fat? I see him as a stronger, faster, shorter Shawn Kemp. hopeful that he has a better head on him then Shawn did. Probably the most spectacular blocked shot ever. Wait, what happened to him? Maybe you're mistaking him for Vin Baker (after the 2 did a round robin?)? After 8 awesome seasons in the Seattle, he got chubby, still put up really solid numbers in Cleveland for 3 years, then fizzled out over his final 3. I think the he was a bit depressed after being duped by the Seattle team into signing a below market value "hometown discount" sort of deal. (same sort of thing happened to Pippen and Cassell). Things went south for Kemp after that season. He had previously signed a long-term contract before NBA salaries took a jump, so he was earning substantially less than most players of his caliber. Kemp threatened to sit out the upcoming season, and the resulting tension led to a three-team trade after the 1996-97 season. Kemp landed in Cleveland, but LeBron was only 13, so Cleveland still sucked. During his three-year tenure with the Cavs, Kemp continuously battled weight issues, showing up to camp at 280 pounds after the lockout-shortened 1998-99 season (he previously weighed 245). Though General Manager Wayne Embry later revealed in his autobiography that Kemp reported to camp at 315 pounds. Embry went on to say that they hired nutritionists and put Kemp on a diet, but he didn’t have the discipline to stick to it. They even went so far as to hire a chef to prepare meals for him, but it didn’t work. Obviously with the money the Cavs spent on him (7 years, $98 million) they wanted him in playing shape, and who could blame them. Though unable/unwilling to shed the weight, Kemp still averaged 20 points and 9 boards for the Cavs, while leading them to a first-round playoff loss against the Indiana Pacers. After the 1999-2000 season, Kemp was traded the Portland Trailblazers and his decline in play continued. His weight struggle took its toll and he quickly lost any explosiveness he had left. He also had problems with cocaine and alcohol, and his first season with the Blazers ended early when he entered drug rehab. He was waived from Portland after two seasons, and went on to play one more year in 2002-03 for the Orlando Magic before being replaced by Juwan Howard. He would go on to make a couple attempts to come back to the NBA, even slimming down to his All-Star weight, but was unable to secure a roster spot. He signed a one-year deal to play for an Italian team in Rome, but only played three pre-season games before he had to return to his home in Houston to assess damage from Hurricane Ike. He and the Italian team agreed to part ways and the contract was rescinded. It could have been a lot worse, but it's not how I thought his career was going to go, after watching the Bulls/Sonics finals. I didn’t read the link you posted but he had substance issues AND he had a lot of children with a lot of different women. I am pretty sure he went broke very fast. Very sad and alarming. You can be super rich and all of that can go down the toilet in a night if you play your cards that poorly. Every athlete about to go pro should watch ESPN's "Broke". They should show it at rookie camp. CAM MUTHAFUKKIN REDDISH...that boy good!! !